Oh Tufte where art thou? In future courses and textbooks dealing with misleading information design, the Wired infograph declaring the death of the Web will be Exhibit A in how to twist data to make a point. According to the now infamous article by Chris Anderson and Michael Wolff, the World Wide Web is dying, and it is being replaced by the app. I will not even try to demolish this argument, it has been done masterfully in Boing Bong, ReelSEO, The Atlantic, and The Observer. Everyone agrees that the way in which the Wired article displayed the chart is highly misleading, but that it also seems to mistake quantity with quality. For example, while it may be true that video bandwidth is increasing, it is wrong to assume that it heralds similar usage increase. People don’t spend all their time online watching videos, it just happens that it produces heavy bandwidth usage. 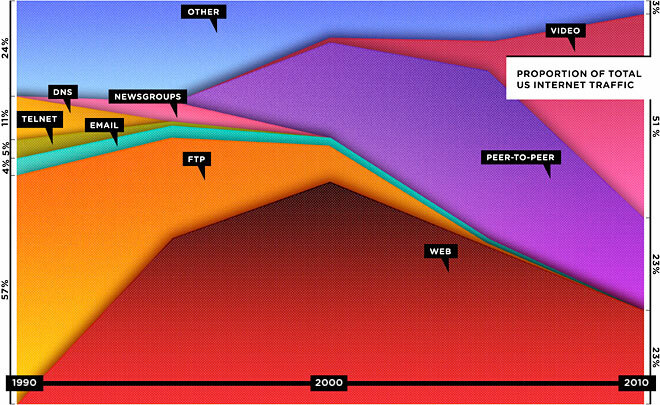 However, the important claim of the Wired article is not the graphic, although most criticism has latched on to it. The real claim of the article is that in the future we will all be using the Internet via apps, and that the Web will lose prevalence. This is at the heart of the modern debate about how we think about the Internet. Will we continue to have an open Web, or will we revert to gated communities where content is provided via pre-approved apps obtained through heavily-guarded online stores such as iTunes? This is what is so disturbing about the Wired article, it is trying to push an agenda, a Jobsian idea of the Internet as a closed and secure system, instead of the open, chaotic and vibrant place that we love and loathe in equal measure. The Apple Internet is a very different place to that which we know, in this vision of the future your browser will be the least important element of your daily interaction with the Internet. In this future, you will open your mobile device (smart phone or iPad), you will read your daily newspaper through a paid app (The Times, The Guardian, NYT), you will also browse the magazines through an app (Wired, The Economist), then you will read your Twitter feed through TweetDeck, check your email through yet another app, plan your route to work using the Google Maps app, and then get to work and read books with the e-book reader app of your choice. During this process, you will not have touched the browser once. Is this future viable? Content owners want us to go that way for sure, because this is the only version of the future that gives them a steady income. The closed Internet is much easier to control, regulate, but also it is easier to get some money from the apps marketplace. I believe that we might soon see an interesting split, those who are happy to buy an iPad and be shackled by the closed app universe will happily walk towards the Jobsian version of the future. Those of us who prefer a more open Web, will probably never migrate. The battle for the future of the Internet is taking place right now. Where do you stand? Apps can still be the future with another interpretation. A bit of generalization ahead. In the beginning of the web there were only apps, for the mainstream there were usually one app for one service, the kind you fear here, as do I. When the web grew it was actually only the http/html web. The number of apps shrank, now we use a single app for email, news, sharing files. Now we start to see services that doesn't require the web, they serve api. You mention tweetdeck, i assume it is from twitter themselves, but there a others too. What I see could become a positive future of the apps where we get a wide variety of not only websites and services but also the next layer of consuming them, the browser, and lots of other applications that either specialize on a specific _type_ of service or aggregate multiple sources. Although I like to see this brighter future I do agree that there is a battle ahead. Or maybe, and much more likely, both app and web (and others) will coexist peacefully with lots of useful transmission of ideas between them. Just because the media thrives on the creation of mythic dualism doesn't mean we have to. The apps-driven future will be postponed indefinitely. A good article,Thank you for sharing!!? !